When choosing a front door for your house, you will basically need to go for one that adds to the curb appeal of your home but is also secure and burglar-proof. Additionally, you want front doors that are sturdy enough to withstand the elements, including strong sunlight, wind, and hail. Among these factors, functionality should be given primary consideration. 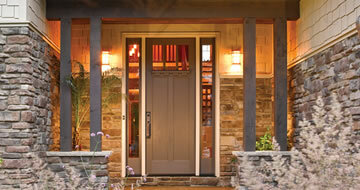 The best way to choose a door that will be functional is to consider the material used for the door. You can choose between wood, fiberglass, steel, and composite. Wood happens to be a favorite for many homeowners. Although wooden doors have, in the past, been criticized for warping, modern wooden doors are constructed from a wood core that is then covered with wood veneer. This makes them sturdier than plain wood. One of the downsides of wood doors is the amount of maintenance that they need. Wood is also sensitive to the elements, especially water and moisture, and may tend to warp with time. Relatively affordable and durable, fiberglass front doors are the number-one choice for many homeowners. They are also maintenance-free, and most of them come with a lifetime warranty. If you live in a humid area or in an area where the weather is extremely harsh, fiberglass composite doors should be your first choice. Steel doors are great for offering insulation. However, they tend to be less durable than either wooden or fiberglass doors. Steel front doors are prone to rust and are therefore not suitable in areas where the climate is humid. When considering aesthetic and curb appeal, the color of the door will be one of the most important determining factors. You can experiment with different colors and shades to find out which one best complements your home exterior.